Our top-priority is keeping DouglasQuarry residents informed. 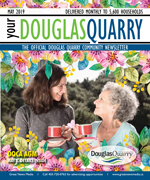 All the community’s must-know news is easily accessible through the DouglasQuarry community newsletter, which is published monthly so that residents are kept current on relevant community and Calgary news. Your DouglasQuarry is delivered monthly to every household, apartment, and business, and is a great way to get hyper local advertising exposure. The DQCA’s mission is to foster community spirit through recreational, cultural, social, athletic and educational activities. The DQCA’s vision is to be a vibrant community that serves all residents, and is fuelled by the generosity of spirit.The DQCA’s values are the following: volunteerism, open communication, honesty, mutual respect, multiculturalism, social justice, creativity, quality of life, and foremost – community building. In the City of Calgary's 2012 municipal census, Douglasdale & Douglas Glen had a population of 16,102 living in 6,783 dwellings, a 4.6% increase from its 2011 population of 15,395.With a land area of 4.8 km2 (1.9 sq mi), it had a population density of 3,350/km2 (8,690/sq mi) in 2012. For more detailed info visit the City of Calgary community profiles site.